I found this as one of the top searches to my blog today: “obama is so pretentious.” I’ve also been privileged to read a few other blogs about how the Left/Liberals/Democrats are being hypocritical. That the Left has heaped scorn upon Bush and now expects “their guy” now “our guy” to be treated with respect. I’m not the spokesperson of the left, but I know I speak for more than myself when I say; Actually, we expect you to continue the same rhetoric. With a few, and noted, exceptions we feel that the Right is going to come in swinging and slandering. Personally, I find that I am the converse of one of my most valued commenters: I cannot escape the Right Wing screaming crazies. I’ve blogged about them before–and I’ve used a very big brush in describing people on the right before. For the record, I think the past eight years should be evaluated and critiqued. If laws have been broken–and yes, a President can break the law–then the consequences should be doled out within the framework we have (ie: within the Constitution). I do not think that Bush & Co should have to endure a witch hunt, but it would be irresponsible to not evaluate the state of the nation. Furthermore, I think that those on the “left” that were complicit should also be held to account. I think the Right’s complaints about how Bush & Co were treated has some merit and it can be (and should be) discussed. Should this discussion preclude working on the issues that the country faces as a whole? No. There are elements in our nation, on the Left and on the Right, that will not work with an administration from the other side. This administration is no different. When the Sean Hannity’s, Michelle Malkin’s and Bill O’Reilly’s in this world consistently treat Obama with the same deference they gave Bush, I’ll have been proven wrong. Until then, I’ll be happy with the exceptions I’ve come to know and respect. I look forward to four years of a president who knows how to use the Bully Pulpit. To be fair, I do expect to be heart broken by Obama at least once in the next four years, but for now I am enjoying the moment. I’m enjoying it enough to recognize that Bush did do a whole hell of a lot for Marine Snctuaries. There. I said a good thing about Bush. 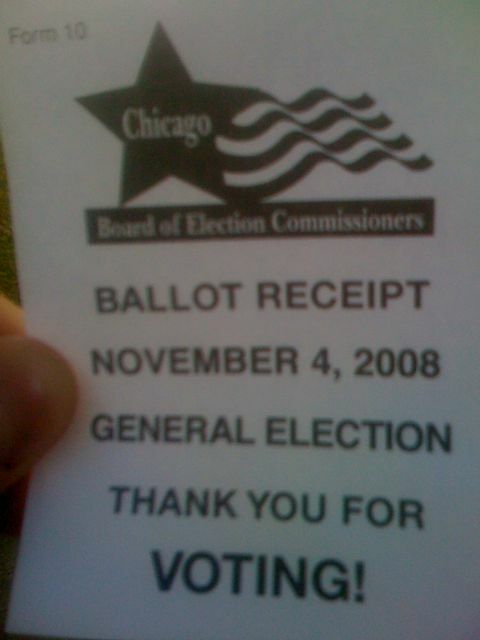 I stood in line for over half an hour to vote. My ballot buzzed when it went through the optical scanner, but it counted. And I didn’t just vote Obama. I voted Green Party. I want the Green party to address my concerns about the justice system, the water supply and representing me in Congress. Now if you’ll excuse me, I’m going to absorb the rest of the day’s news directly into my bloodstream.